Reprinted with permission from The Baltimore Sun, December 23, 2001. Above: The second-floor Sunday school room at St. Michael Lutheran Church is a place for simple, dependable joys. Trilla Rinaca (facing camera) says good morning to Marie Gonnsen, while Minerva Houck - the group's founder - unpacks a box of donated fabric. There were no labels on the quilts. No "Made by the ladies of St. Michael Lutheran Church in Perry Hall." No "Sewn by Agnes" or "Knotted by Elaine." No embroidered initials of the 13 women whose lined and spotted hands had produced these patchwork gifts for strangers. Last year, 150 quilts wrapped in weather-proof plastic were loaded onto a container ship and sent across the ocean. When the ship reached shore and the quilts were distributed, the men and women who received them would know only what they could see: simple design, eclectic blends of fabric, machine-sewn stitches and hand-tied knots of yarn. No one would know the names of the Perry Hall women who've made thousands of quilts in the 10 years for people they don't know and never will; women who have faith in their work without seeing the result of it. No one would know that they yelled "Show and tell!" whenever a quilt was finished, and that all the women stopped working to admire it. "Let's see the back again." "Perfect colors for a girl." 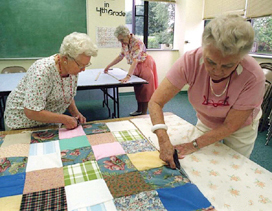 Left: They've made thousands of quilts, but still labor with urgency: Catherine Oppenheim and Evelyn Walters pin and trim the three-ply bed covering. 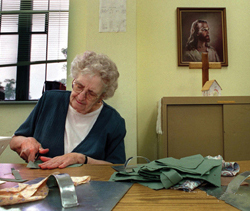 Right: Minerva Houck, founder of the church's quilting group, cuts out sqaures for quilts. No one would know that the women met every week in a second-floor Sunday school room overlooking a cemetery where some of their husbands were buried, in a church that some of them had attended since childhood. No one would see them on Tuesday mornings, hugging as if they'd been apart for ages, setting up their assembly line of sewing machines and taking out the squares they'd cut and stitched at home. The quilts were made from donated material. The boxes and bags were always arriving, and the women unpacked the cloth as if it were treasure, from the never-used bed sheets to the discarded draperies to the fabric bought for a summer dress but never sewn. The women prided themselves on using everything people gave them. They'd lived through the Depression and war years; they know how to be frugal. Mixing and matching was part of the fun. 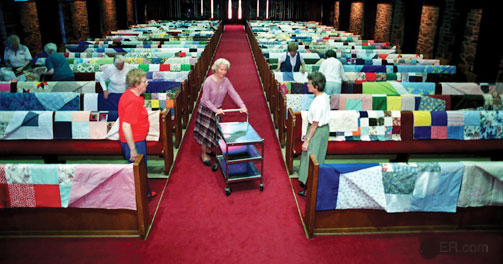 Above: Marie Gonnsen (center) and the other St. Michael quilters arrange their quilts on the pews a few days before Sunday services, where they'll be displayed until being delivered to the warehouse for shipment by Baltimore-based Lutheran World Relief. Sometimes the women labored in silence, except for the clicking of scissors and the chugging of sewing machines, but mostly they talked. They discussed church business and told jokes and caught up on each other's lives - who was taking a bus trip, who was having company, who was feeling better that morning, or worse. But they never stopped working. Except for lunch, they didn't take breaks. In the spring of last year - as they did whenever the quilt cupboard was filled - the St. Michael women hauled 150 quilts into the church sanctuary and draped them over the pews, flipping up the corners so the backs would be noticed, too. Sunday services that week felt particularly warm and festive; people rested their hands on the colorful cloth while they prayed. 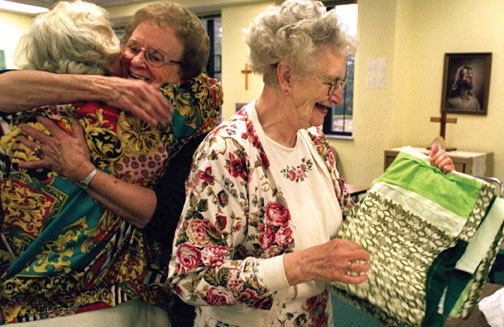 A few days later, the women drove the quilts to a warehouse in Carroll County. After unloading the cargo, the women didn't leave right away. They watched as the quilts were counted and weighed, compressed into tight, airless bundles and bound in thick plastic. From here, Baltimore - based Lutheran World Relief would take over, shipping the quilts overseas to people in need. As usual, the women of St. Michael didn't know where their quilts would be sent, when they would arrive or who would receive them. They weren't relief workers or policy makers or experts on refugees. But they know how to make quilts, and Tuesday was just around the corner. Soon they'd be back at work - Elaine, Minerva, Ruth, Trilla, Delores, Marie, Jean, Marge, Agnes, Catherine, Ruby, Evelyn and Mary-making quilts with no labels for nameless people far away.